Habib Sadat was the second artist to take up residence in the art studio of our Room to Breathe exhibition, from 6 December 2018 until 13 January 2019. As well as working from and exhibiting a selection of his works in the art studio, Habib also led an Afghan cooking class, one of a series of cookery classes run by Migrateful that we are hosting held in the kitchen area of Room to Breathe. When I arrived in the UK on 1 June 2016, I was sent to a detention centre. I was always thinking about what was going to happen to me and how long I was going to be there. It was a challenge for my mental health. At times I felt hopeless, and I decided to do something to fill my time in a positive way. I found out there was an art room and, the moment I saw it, I felt better. I started to make things – rugs from old fabrics, clay temples and paintings. I’d spend all day there. It took my mind off everything that was happening with the Home Office. Once I left the detention centre, I connected with friends that I had met in the Calais camp and on my journey. I got involved in art projects and I joined a group of refugees performing a play called Borderline about the Calais refugee camp. With old friends and new friends, I felt I was part of a family. It got better and better. There have been difficulties and darkness in my life. I’ve lost everything. But something has always happened that has given me the power to step forward and keep going. As long as I can keep active, make art and do what I can to help other people, I can keep going. The art studio inside our Room to Breathe exhibition is a space curated by visual art and educator Dima Karout to explore the role of art and creativity in helping people settle into new lives in Britain, and to offer educational art experiences for visitors. 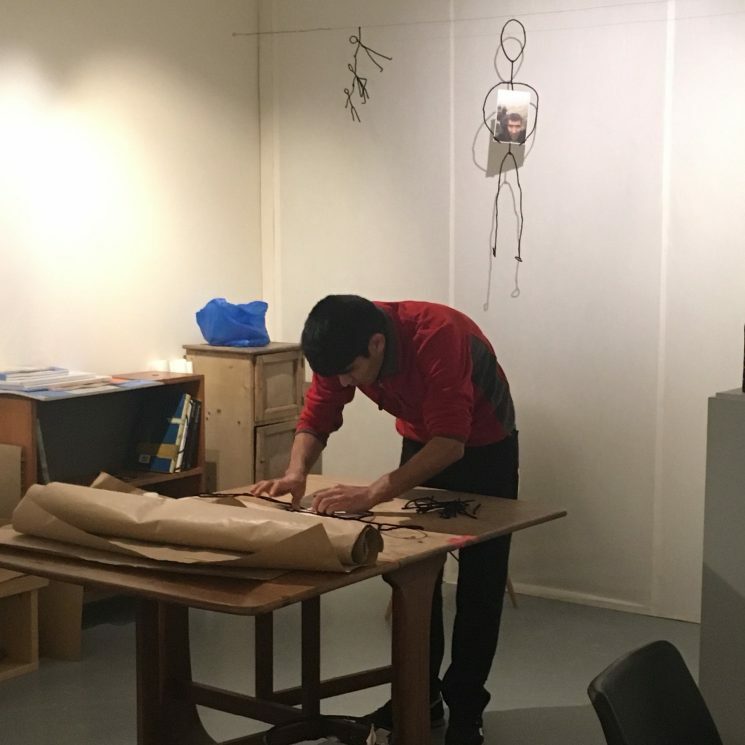 Each month, the studio will host a different migrant artist to share their work and process.